Presenting this fabulous value for money 3 bedroom 2 bathroom front line Golfapartment. The location of this luxurious apartment couldn?t be better. 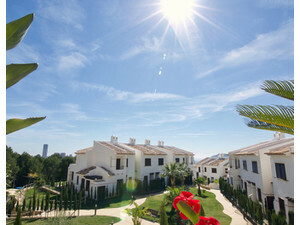 Looking onto the stunning golf course of ?Las Ramblas’ and a very short walk to the club house, restaurant and facilities. You can arrive in around 45 minutes to Alicante or 30 minutes to Murcia airport through a short drive to the AP-7 motorway, making this property perfect for those quick get a ways. Five minutes? drive reaches ?La Zenia Boulevard? shopping mall and will have you arrive at the stunning beaches of the Orihuela Costa. Not only are you directly on an 18 hole, very prestigious golf course but within a five-minute drive you can reach the other three, Villamartin, Campoamor and Las Colinas. This property really is a golfer?s dream! No hassle with gardens and maintenance as your garden is the golf course. A fifteen-minute walk brings you to ?La Fuente? the busiest commercial centre in the area The apartment itself occupies three sides of the building giving plenty of light to all areas. The floors have been finished in marble giving a luxurious feel. The property benefits from modern efficient air conditioning in all rooms and is being sold fully furnished. This apartment really needs to be viewed as it?s in fabulous condition.